This high purity very long chain fatty acid methyl ester is ideal as a standard and for biological studies. X-linked adrenoleukodystrophy (X-ALD) is an inherited disorder of peroxisomal metabolism and is characterized by deficient betaoxidation of saturated very long chain fatty acids (VLCFA) such as hexacosanoic acid. 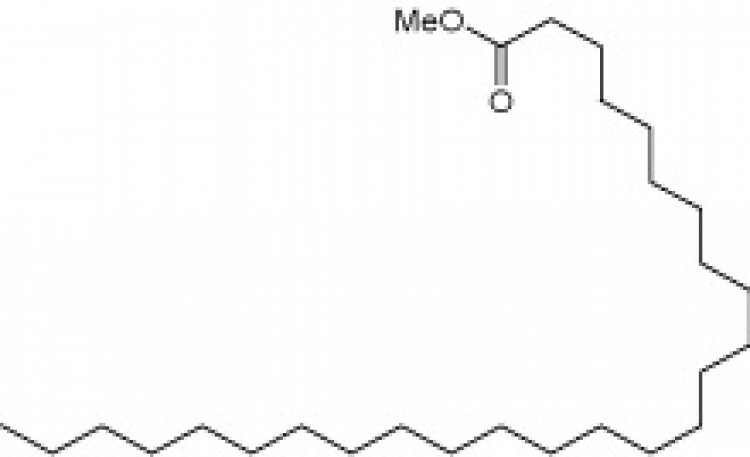 Indeed, some studies show hexacosanoic acid as the most prevalent VLCFA in X-ALD, causing oxidative damage of proteins early on in the disease.1 Hexacosanoic acid has also been found to be closely linked to a high risk of atherosclerosis and metabolic syndrome.2 In plants, VLCFA are converted to long chain hydrocarbons which are used to make waxes that are essential to their survival.3 VLCFA acylated to sphingolipids are critical in many biological functions4 and substantial amounts are found to be amidelinked to the long-chain sphingoid base sphinganine, forming a ceramide, which constitutes the lipid backbone of sphingomyelin and other sphingolipids. VLCFA can often be found in esterified linkages with cholesterol, gangliosides, galactocerebrosides, sphingomyelin, and phosphatidylcholine. In myelin, VLCFA are important in increasing the structural stability.